Keep a Playground Playable. Contribute to the Playground Maintenance Fund. Continuous play on our playgrounds equals broken down playgrounds! Since 2007, Playground Builders has built 22 playgrounds in Palestine, including 5playgrounds in Gaza and 17 in the West Bank. 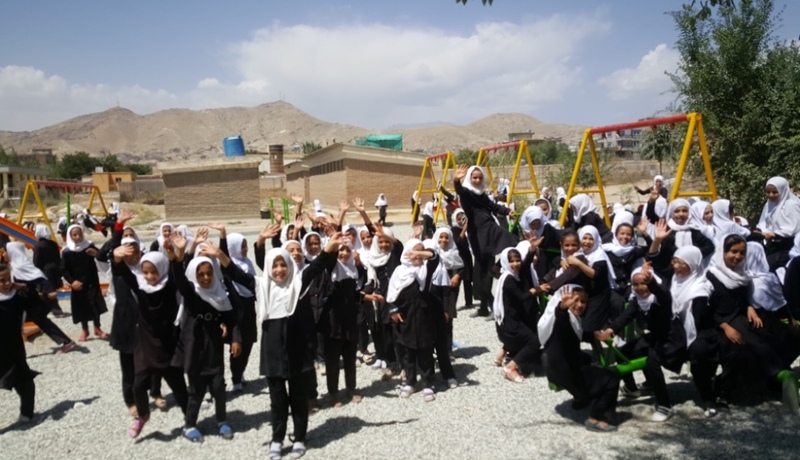 While these playgrounds continue to provide fun, social interaction and respite for children in these oppressed areas, after years of heavy use (i.e., fun and play), some of them need repairs. Your donations will go directly toward repairing or replacing swings, slides, teeter totters, etc. Funding may also go toward fixing playground sites, such as installing new gravel, grass or concrete. Most of the playgrounds in the West Bank and Gaza are located in neighbourhood centres, refugee camps and on donated property. As such they are not as likely (as our school playgrounds) to be repaired and maintained due to a lack of money and/or materials. There are huge numbers of children in both the West Bank and Gaza: With a total population of 2.7M in the West Bank, 37% is 14 years of age or under. In Gaza, with a population of 1.7M, 45% is 14 or under. Further, the average age in Gaza is only 16. That means that only some of the children in Paletine could benefit from one of our 22 playgrounds (but we’re building more!). In addition to building more playgrounds, we need to keep these playgrounds operational and safe. Donations to this project will go directly to repairing playgrounds in various communities throughout Palestine. Some of these playgrounds were built as early as 2007. After 10 years of wear and tear, they need refurbishment. A repair and maintenance program was set up in 2010 but to date very few repairs have taken place. An updated repair program will be completed in 2017, and we anticipate that at least $25,000 is required to repair/maintain/upgrade the playgrounds. Local people will be engaged to fix the playground equipment and playground sites as necessary. This project will therefore provide jobs and income for maintenance people in these poverty-stricken areas. The psychological effects on children of continuous war in Gaza are severe. Due to the Occupation’s containment measures and slow rebuilding efforts, these child victims experience little reprieve and no fun time. So it’s important that we keep the five playgrounds in Gaza in good repair so that at least a few smiles can resonate through the devastation. Due to barricades and closed borders, our main challenge in Gaza is keeping up with the status of our playgrounds. For example, one playground was severely damaged in 2009 during “Operation Cast Lead.” We are happy to report that the community rallied together and rebuilt it. Our 17 playgrounds in the West Bank are all utilized to the maximum. Most are centrally located and have open access allowing thousands of kids to have some fun. Endless play on the equipment, of course leads to wear and tear. Our challenge is keeping up with the repairs and the most critical challenge is paying for the repairs and replacements necessary to keep providing play! The solution is to make funds available for local playground stewards to fix or replace equipment as needed and to ensure the grounds are safe from hazards. Further, the stewards must be able to do this on an on-going basis. This special fundraising project will provide these funds and make sure that any broken down playgrounds are playable once again! While building new playgrounds is our core business, keeping our existing playgrounds going is just as important and is central to the sustainability of play in these impoverished communities. High birthrates in the Palestinian Territories means new kids arrive at the playground constantly. So although the playground may have been built several years ago, it’s always new to some new excited little ones. Play, laughter and joy impacts entire Palestinian communities. Happy children mean happy parents. Our purpose is to produce both new and renewed smiles. Again, our hope is that eventually Playground Builders will not be needed in the Palestinian Territories, because the decision-makers will decide to include play as a core component of their communities and curriculums.